Rezoning is the process of changing the zone that applies to a property or piece of land. Rezoning is needed if you want to develop your site in a way that isn’t allowed by the current zoning. 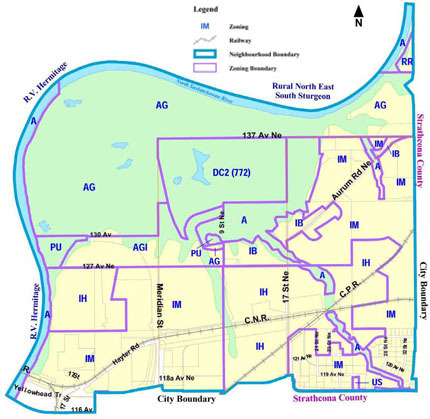 To verify the zoning of a property, visit our office or maps.edmonton.ca. The Zoning Bylaw enables you to view specific land use zones along with the uses, regulations and standards. Go to “Part II – Zones, Direct Control Provisions, Overlays and Special Areas” within the left-hand navigation column and choose a zoning category to find the zone you are looking for. Requests to rezone a property are submitted online through the City’s Land Development Application web page. Paper applications are no longer accepted. Applications can be made by a private individual or by a consultant on behalf of a landowner. Along with the standard submission requirements, almost all industrial rezoning applications will require a Phase I Environmental Site Assessment, which must be submitted before an application is accepted for review. A Risk Assessment Report is required when heavy industry or an industrial activity involving hazardous materials is proposed near residential areas or near land uses that involve large gatherings of people. Additional studies and reports may also be requested as the application is assessed and reviewed. The planner responsible for the application will inform the applicant of any additional reports, studies or assessments that are required. All rezoning applications for the Edmonton Energy and Technology Park require additional reports and studies, beyond those of a standard application. These requirements are listed in Section 11 of the Edmonton Energy and Technology Park Area Structure Plan. All studies must be approved by the City before a rezoning is taken to Council. Industrial rezoning applications follow the standard rezoning process and timeline. These applications take an average of 6 months to 1 year, depending on the complexity of the application, the ability to revise the application based on feedback, and the time to properly prepare and review any requested reports and studies.